Can one ever have enough barbeque tools? 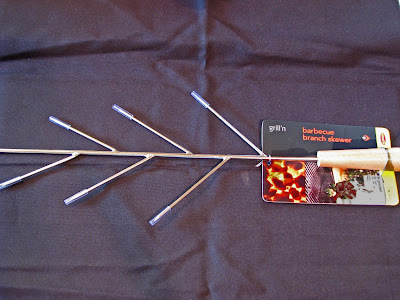 This barbeque gadget, the “Barbecue Branch Skewer”, was under the Christmas tree. It is very unique looking and has a lot of sharp points. It is advertised as being able to hold twice as much food as a traditional skewer and it is perfect for kabobs, sausage, vegetables and more. Well, we shall see. Tonight’s dinner would consist of a couple of nicely marbled New York steaks from Angelo’s Meats. It probably would be a good idea to put a couple of vegetables on the plate for color contrast. 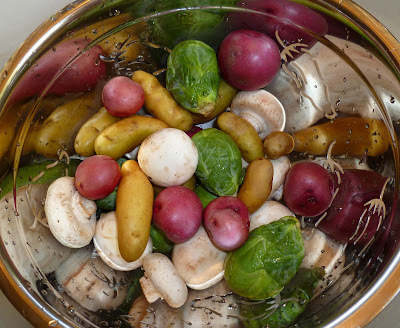 Some nice fingerling potato’s, red potato's, mushrooms and believe it or not Brussel sprouts were blanched in some boiling salted water. This vegetable mixture was cooled and placed into a marinade of garlicky Italian dressing. 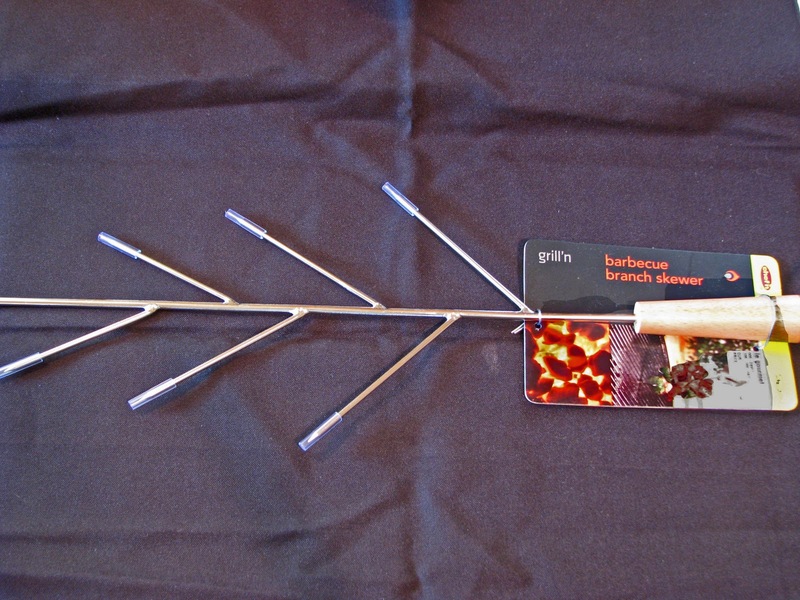 After a little soaking the vegetables were arranged on this Christmas tree looking skewer device. It did look a little cute. A hot smoky fire was the trial test of our new utensil. The handle almost caught on fire and will have a permanent scar from its ordeal. It did make the turning of the vegetables easy except I had to wear my welder gloves to grab the handle. We had a wonderful dinner. This may be the first time I actually enjoyed Brussel sprouts. The Barbecue Branch Skewer did its job as advertised. The handle has some nice fire scarring and will survive. In fact it will have a perfect resting spot in the back of the gadget drawer. My eyes are drawn to that New York....Oh yes there are vegetable on that plate. My eyes, on the other hand, are drawn to those Brussels sprouts. I love those little green balls but My Beloved is generous with sharing his portion, so I'm always looking for new ways to cook them, hoping one day to convince him of their excellence. 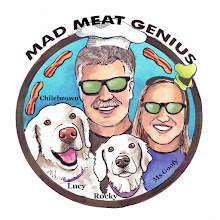 :-) Love the skewer thing, too - very cool. Greg, My go to steak is the rib-eye. This New York was excellent. Probably because I got it from Angelo's. 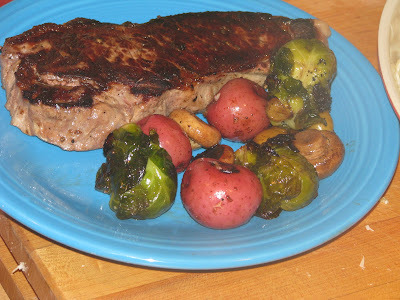 Zoomie, Ms. Gooy commented that she actually liked the brussel spouts too. Try par cooking and finishing off on the grill. Most wonderful. Well now, I think that's officially "newfangled". But I have to admit, I've got to have one. To answer your question: absolutely those jalapenos were hotter once pickled. Even with veins and seeds removed. Wonder why? Oh no! Not relegated to the back of the gadget drawer. 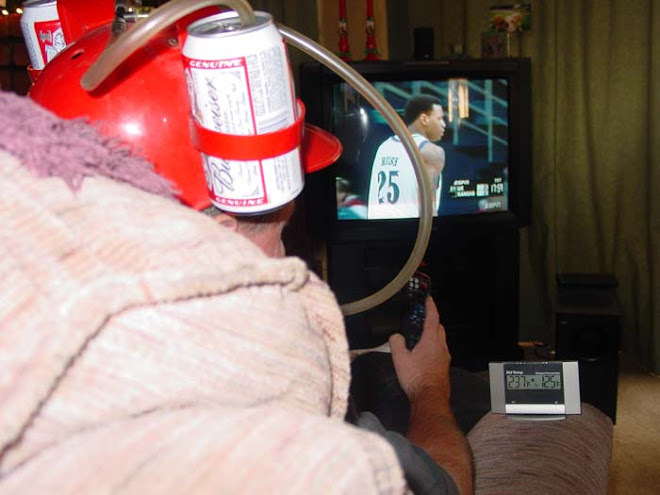 I actually liked the idea of this. It would probably work better on a rectangular grill with only on side on. 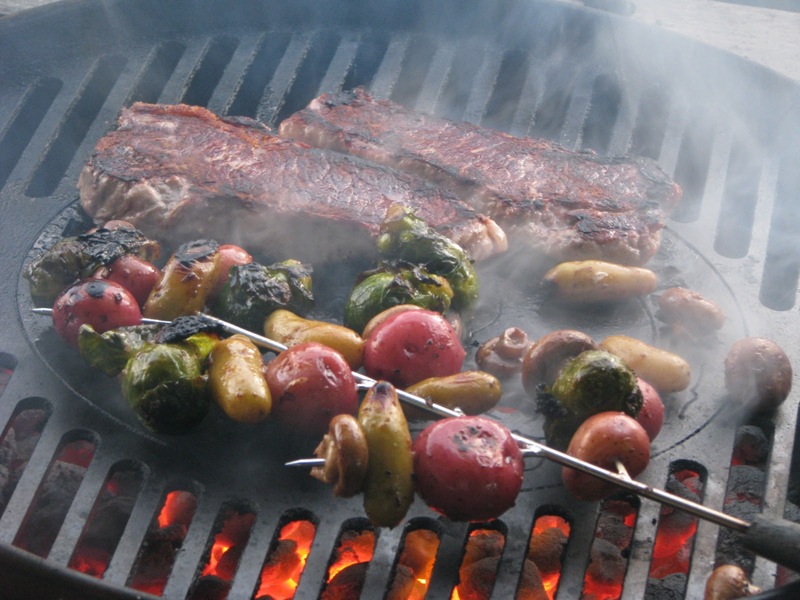 That's why I like my firewire skewers for round grills.